Boats have served as transportation since the earliest times. Circumstantial evidence, such as the early settlement of Australia over 40,000 years ago, findings in Crete dated 130,000 years ago, and in Flores dated to 900,000 years ago, suggest that boats have been used since prehistoric times. The earliest boats are thought to have been dugouts, and the oldest boats found by archaeological excavation date from around 7,000–10,000 years ago. The oldest recovered boat in the world, the Pesse canoe, found in the Netherlands, is a dugout made from the hollowed tree trunk of a Pinus sylvestris that was constructed somewhere between 8200 and 7600 BC. This canoe is exhibited in the Drents Museum in Assen, Netherlands. Other very old dugout boats have also been recovered.Rafts have operated for at least 8,000 years. A 7,000-year-old seagoing reed boat has been found in Kuwait. Boats were used between 4000 and 3000 BC in Sumer, ancient Egypt and in the Indian Ocean. Boats played an important role in the commerce between the Indus Valley Civilization and Mesopotamia. 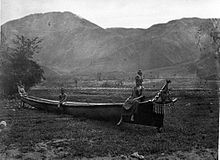 Evidence of varying models of boats has also been discovered at various Indus Valley archaeological sites.Uru craft originate in Beypore, a village in south Calicut, Kerala, in southwestern India. This type of mammoth wooden ship was constructed[when?] solely of teak, with a transport capacity of 400 tonnes. The ancient Arabs and Greeks used such boats as trading vessels.